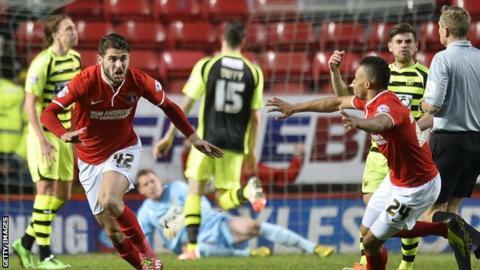 Charlton boosted their Championship survival hopes with victory over relegation rivals Yeovil at The Valley. Astrit Ajdarevic fired in an early opener from outside the penalty area for Jose Riga's side but Joel Grant equalised quickly for the visitors. Dorian Dervite headed Charlton back in front and Marvin Sordell added a third. Kieffer Moore pulled one back for Yeovil, who remain bottom - while victory keeps the Addicks two points clear of the relegation zone. Former Sweden Under-21 international Ajdarevic, on loan from Standard Liege, struck first when he collected a loose ball on the halfway line, beat one Yeovil challenge and fired past keeper Chris Dunn into the bottom corner. Yeovil were level within two minutes, as James Hayter found Grant, whose shot was deflected in off defender Richard Wood. Hayter then scuffed a chance from eight yards out, before Charlton's Iranian forward Reza Ghoochannejhad missed a good chance from close range. Joe Ralls had two chances in as many minutes for Yeovil, fizzing a shot just over from 20 yards and forcing keeper Ben Hamer to stop his left-footed drive, before Tom Lawrence hit the bar direct from a corner. At the other end Dunn made a superb save to tip a Sordell shot around the post before half-time but was helpless when defender Dervite powered home a 48th-minute header from Johnnie Jackson's corner. Sordell then added a third, tapping in after Dunn failed to hold Ghoochannejhad's right-wing cross. And although substitute Moore ensured a tense finish when he slotted into an empty net following a defensive mix-up, Charlton saw out the game to ensure victory. "The result was the most important thing. The players showed they are not just strong technically and physically, but mentally as well. "Now the other teams above us are concerned. Teams such as Birmingham and Blackpool are now in it and we still have two games in hand." "The fat lady is not quite singing yet, but it's a poor result as far as our season is concerned because this was going to be a key game. "I'm disappointed that we lost concentration at the start of both halves. We had some good chances, but so did they." Match ends, Charlton Athletic 3, Yeovil Town 2. Second Half ends, Charlton Athletic 3, Yeovil Town 2. Ruben Palazuelos (Yeovil Town) is shown the yellow card. Attempt missed. Liam Davis (Yeovil Town) left footed shot from outside the box is high and wide to the left. Assisted by Tom Lawrence. Attempt blocked. Tom Lawrence (Yeovil Town) right footed shot from outside the box is blocked. Offside, Yeovil Town. Kieffer Moore tries a through ball, but Shane Duffy is caught offside. Substitution, Charlton Athletic. Leon Cort replaces Marvin Sordell. Marvin Sordell (Charlton Athletic) wins a free kick in the defensive half. Foul by Byron Webster (Yeovil Town). Attempt blocked. Marvin Sordell (Charlton Athletic) right footed shot from outside the box is blocked. Foul by Shane Duffy (Yeovil Town). Attempt missed. Kieffer Moore (Yeovil Town) header from the centre of the box misses to the right. Assisted by Joe Edwards with a cross. Attempt saved. Callum Harriott (Charlton Athletic) left footed shot from the right side of the box is saved in the centre of the goal. Assisted by Dorian Dervite. Delay in match Jonathan Obika (Charlton Athletic) because of an injury. Substitution, Yeovil Town. Ruben Palazuelos replaces Joe Ralls. Substitution, Charlton Athletic. Callum Harriott replaces Reza Ghoochanneijhad. Joe Ralls (Yeovil Town) is shown the yellow card for a bad foul. Jonathan Obika (Charlton Athletic) wins a free kick in the defensive half. Corner, Yeovil Town. Conceded by Michael Morrison. Attempt blocked. Liam Davis (Yeovil Town) right footed shot from the left side of the box is blocked. Assisted by Kieffer Moore. Substitution, Charlton Athletic. Jonathan Obika replaces Astrit Ajdarevic. Goal! Charlton Athletic 3, Yeovil Town 2. Kieffer Moore (Yeovil Town) right footed shot from the centre of the box to the bottom right corner. Assisted by James Hayter. Attempt missed. Astrit Ajdarevic (Charlton Athletic) left footed shot from outside the box misses to the right. Assisted by Ben Hamer. Attempt missed. Marvin Sordell (Charlton Athletic) left footed shot from outside the box misses to the left. Assisted by Astrit Ajdarevic. Foul by Jamie McAllister (Yeovil Town). Hand ball by Tom Lawrence (Yeovil Town). Hand ball by Liam Davis (Yeovil Town). Offside, Yeovil Town. Joe Ralls tries a through ball, but Shane Duffy is caught offside. Substitution, Yeovil Town. Kieffer Moore replaces Joel Grant. Tom Lawrence (Yeovil Town) wins a free kick on the right wing. Reza Ghoochanneijhad (Charlton Athletic) wins a free kick in the attacking half.